This second frame I deviated from satin stitch and tried some leaf stitch and Algerian eye stitch. For the corner red , when it looked too big for satin stitch in red colour, I changed it into Algerian eye stitch. 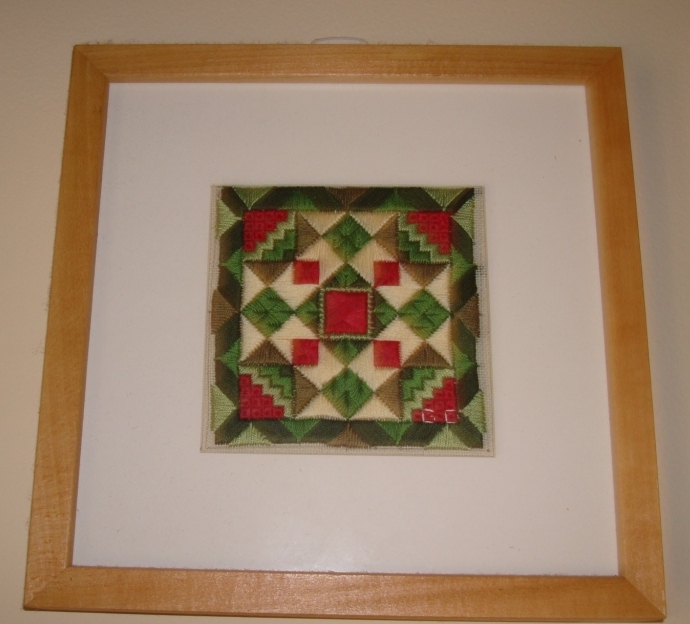 The four diamond shapes in medium green was surrounded by satin stitches in different directions, this immediately called for some other stitch, and the chosen one was leaf stitch. Though it was done in one colour, the effect is totally different. The colours are three shades of green , brownish green, red and cream. Since there were only two frames, I could try only two designs. It was an interesting venture with lots of possibility for creativity, though I did not use much here!